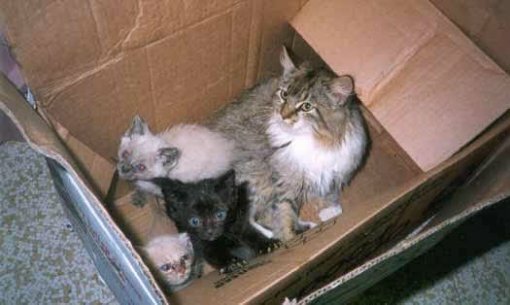 Just one cat and all her young in a period of seven years can give birth to 420,000 kittens, and one mother dog and her young during the same period of time can give birth to 67,000 puppies. Drowning just born kittens, strangling the puppies, poisoning, throwing animals on the street, running them down, shooting them with hunting guns, hunger, thirst, illnesses or euthanasia in a veterinary clinic happen every day to lots of animals who never received a chance to live. The only prevention of this problem is spaying and neutering of companion and stray animals. Therefore Animal Friends organizes an action with info stall in order to educate citizens on the necessity of spaying and neutering of companion animals. The event will take place on Thursday, August 24, 2006 at 12 noon, in Gajeva ulica in front of Hotel Dubrovnik. The info stall will be accompanied by guardians together with their spayed and neutered companion animals who want to stand as example to other citizens by showing the humane gesture of adopting abandoned animals and also demonstrate the appropriateness and necessity of spaying/neutering. Detailed information on spaying and neutering will be provided by the veterinarian and manageress of the Shelter for abandoned animals of the City of Zagreb, Tatjana Zajec. With this action, which is directly linked to our campaign against the abandoning of companion animals before summer vacations titled "Family at the Seaside, Dog on the Street?!" we appeal to the people of Zagreb to act responsibly towards their companion animals and not to abandon them, and thus prevent them being killed in the traffic or placing them in animal shelters. Spaying and neutering prevents uncontrolled growth of the population of companion animals, unnecessary violent killings, number of unwanted puppies/kittens and everlasting problem of finding good homes for them. Furthermore, spaying and neutering prevents the psychological suffering of animal because one cannot satisfy their natural urges. Spaying and neutering is the ideal prevention of diseases such as breast or uterus cancer, sepsis, prostate or testicular cancer, plus spayed and neutered animals live longer. Nowadays these surgical procedures are preformed routinely and just after a few hours the animal is recovered. 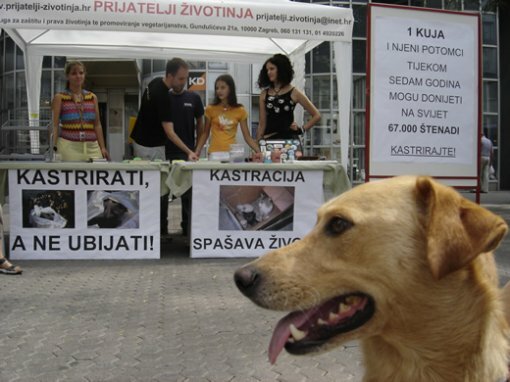 "Don't kill, spay and neuter" should not be just a slogan, because in spite of the huge problem of abandoned animals that are being killed in the cities immediately upon being caught, while hunters manipulate the shameless Hunting Law whenever they can, in Croatia there are no general spay/neuter programs, which could significantly help in reducing the number of abandoned animals. Abandoned animals are not an issue of so called animal lovers and societies, but of all the citizens of Croatia. The city, county and government authorities should take responsibility for them, systematically solving this issue by providing shelters and homes for them, by organizing spay/neuter programs, education programs, and by punishing irresponsible owners. Animals must not become the victims of those who made them to become an issue!